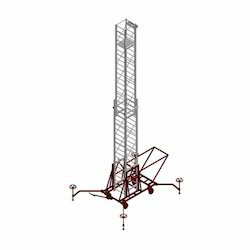 Pioneers in the industry, we offer tower ladders from India. Load capacity up to 150 kgs. (330 lbs). Tower ladders are highly sturdy and very economical and are manufactured with quality material that adheres to same stringent quality and safety standards that all our other products follow. They are generally used when the conventional ladders cannot be used for both industrial as well as commercial applications. Economical yet sturdy ladder suitable for working at great heights. Tower ladder base frame made up 80 x 40x 2 mm M.S rectangular tube. Aluminium ladder made up of special Z type rectangular stile and square rung thickness of 1.5 mm. Aluminium ladder mounted on pins with the help of pillow block bearing. Aluminium ladder designed with tool tray. Load capacity is up to 150 kgs. (330 lbs). Galvanized steel wire rope provided. Up to 4500 kgs breaking strength for tilting and extension. Ladder movements by manual winch load capacity up to 0.5 ton with help of 8 mm diameter wire rope. 4 outriggers with jack bolts for extra stability. 4 solid rubber (16") wheels - 2 swiveling in front & 2 fixed in rear. Working platform with hinged arrangement. Tow bar for push / pull. Stile of rectangular box section for better rigidity and arrest of sway in extended position. Pneumatic wires provided on request. Looking for Tower Ladders ?